The Alamanni, Allemanni, or Alemanni were originally an alliance of Germanic tribe located around the upper Main river (Germany ). One of the earliest references to them is the cognomen Alamannicus assumed by Roman Emperor Caracalla, who ruled the Roman Empire from 211–17 and claimed thereby to be their defeater. The nature of this alliance and their previous tribal affiliations remain uncertain. The alliance was aggressive in nature, attacking the Roman province of Germania Superior whenever it could. Generally it broadly followed the example of the Franks, the first Germanic tribal alliance, which had stopped the Romans from penetrating north of the lower Rhine and subsequently invaded the Roman province of Germania Inferior. From the first century, the Rhine had become the border between Roman Gaul and tribal Germania. Germanic peoples, Celts, and tribes of mixed Celto-Germanic ethnicity were settled in the lands along both banks. The Romans divided these territories into two districts, Germania Inferior and Germania Superior situated along the lower (north) and upper (south) Rhine respectively. Upper Germania included the region between the upper Rhine and the upper Danube, (the Black Forest region that was larger than today: see Hercynian Forest). The Romans called this the Agri Decumates, (i.e. "Decumates territories"), a name of unknown origin. Some scholars have translated the expression as "the ten cantons", but whose cantons of what entity is not known. The exterior Roman fortified border around the area of Germania Superior was called the Limes Germanicus. The assembled warbands of the Alamanni frequently crossed the limes, attacking Germania Superior and moving into the Agri Decumates. As a confederation, from the fifth century, they settled the Alsace and expanded into the Swiss Plateau, as well as parts of what are now Bavaria and Austria , reaching the valleys of the Alps by the eighth century. According to Historia Augusta the confederates in the third century were still simply called Germani. Proculus, an imperial usurper in 280, derived some of his popularity in Gaul by his battle successes against the Alamanni. The Alamanni, thereafter became the nation of Alamannia, that was sometimes independent, but more often was ruled by the Franks. The name of Germany and the German language, in French, Allemagne, allemand, in Portuguese Alemanha, alemão, and in Spanish Alemania, alemán, are derived from the name of this early Germanic nation. Persian and Arabic also designate Germans Almaani, and Germany as Almaan in Persian and Almaania in Arabic. In Turkish, German is 'Alman' and Germany is 'Almanya'. The region of the Alamanni was always somewhat sprawling and comprised a number of different districts, reflecting its mixed origins. 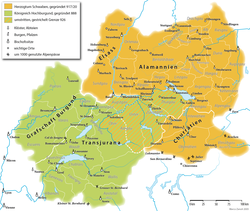 In the Early Middle Ages its territories were divided between the Diocese of Strassburg, which dates from about 614, the territory of Augusta Vindelicorum (Augsburg) from 736, the Moguntiacum (Mainz) archdiocese from 745, and of Basilia (Basel) from 805. Its distinctive laws were codified under Charlemagne as the Duchy of Alamannia in Swabia. Today the descendants of the Alamanni are divided between parts of four nations: France (Alsace), Germany (Swabia and parts of Bavaria), Switzerland and Austria, and the German spoken in those regions has distinctive regional dialects. The German spoken today over the range of the former Alemanni is termed Alemannic German, and is recognised among the subgroups of the High German languages. Alemannic runic inscriptions such as those on the Pforzen buckle are among the earliest testimonies of Old High German.The High German consonant shift is thought to have originated around the fifth century either in Alemannia or among the Langobards; before that the dialect spoken by Alemannic tribes was little different from that of other West Germanic peoples. contemporary distribution of Alemannic dialects. Another source derives the Ala- from *al-, "beyond", often in the sense of "other", from which are also derived Greek allos "other, alien" and Old High German Elisâzzo " (Elsaz or Alsace): "the land on the other side of the Rhine ". The least likely derivation of the Alamanni is Alan-Manni, the reason being that Alamanni, as far as can be determined from initial contacts, was not a self-imposed name. The Alans, moreover, were never in the region, did not originally speak Germanic and had no influence over any Germanic folk west of the Vistula, nor did they acquire any influence under Attila, who bypassed the region, nor from the Ostrogoths of Pannonia after Attila. Walafrid Strabo, a monk of Abbey of St. Gall writing in the ninth century remarked, in discussing the people of Switzerland and surrounding regions that only foreigners called them Alamanni, but that they gave themselves the name of Suevi. If true of the ninth century, this observation may not necessarily equally apply to the fourth. In short we do not know who applied the name and exactly when. It was, however, well established among a variety of historians and geographers. An interesting fact of the word Allemanni is that the French name for Germany is "Allemagne", most likely derived from the Allemanni tribe of "All Men", also based on the Federation of Tribes that formed in the 3rd Century and attacked the Roman Empire. The Alamanni were first mentioned by Cassius Dio describing the campaign of Caracalla in 213. At that time they apparently dwelt in the basin of the Main , to the south of the Chatti. Cassius Dio ( 78.13.4) portrays the Alamanni as victims of this treacherous emperor. They had asked for his help, says Dio, but instead he colonized their country, changed their place names and executed their warriors under a pretext of coming to their aid. When he became ill, the Alamanni claimed to have put a hex on him (78.15.2). Caracalla, it was claimed, tried to counter this influence by invoking his ancestral spirits. In retribution Caracalla then led the Legio II Traiana Fortis against the Alamanni, who lost and were pacified for a time. The legion was as a result honored with the name Germanica. The Historia Augusta, Life of Antoninus Caracalla, relates ( 10.5) that Caracalla then assumed the name Alamannicus, at which Helvius Pertinax jested that he should really be called Geticus Maximus, because in the year before he had murdered his stepbrother, Geta. Not on good terms with Caracalla, Geta had been invited to a family reconciliation, at which time he was ambushed by centurions in Caracalla's army and slain in his mother Julia's arms. True or not, Caracalla, pursued by devils of his own, left Rome never to return. Caracalla left for the frontier, where for the rest of his short reign he was known for his unpredictable and arbitrary operations launched by surprise after a pretext of peace negotiations. If he had any reasons of state for such actions they remained unknown to his contemporaries. Whether or not the Alamanni had been previously neutral, they were certainly further influenced by Caracalla to become thereafter notoriously implacable enemies of Rome. This mutually antagonistic relationship is perhaps the reason why the Roman writers persisted in calling the Alamanni barbari, "savages". The archaeology, however, shows that they were largely Romanized, lived in Roman-style houses and used Roman artifacts, the Alemannic women having adopted the Roman fashion of the tunic even earlier than the men. Most of them probably were in fact resident in or close to the borders of Germania Superior. Although Dio is the earliest writer to mention them, Ammianus Marcellinus used the name to refer to Germans on the Limes Germanicus in the time of Trajan's governorship of the province shortly after it was formed, circa 98/99. At that time the entire frontier was being fortified for the first time. Trees from the earliest fortifications found in Germania Inferior are dated by dendrochronology to 99/100. Shortly afterwards Trajan was chosen by Nerva to be his successor, adopted with public fanfare in absentia by the old man shortly before his death. By 100 Trajan was back in Rome as Emperor instead of merely being a Consul. "A fortification which was founded on the soil of the Alamanni that Trajan wished to be called with his own name"
In this context the use of Alamanni is possibly an anachronism but it reveals that Ammianus believed they were the same people, which is consistent with the location of the Alamanni of Caracalla's campaigns. The early detailed source, the Germania of Tacitus, has sometimes been interpreted in such a way as to provide yet other historical problems. In Chapter 42 we read of the Hermunduri, a tribe certainly located in the region that later became Thuringia . Tacitus stated that they traded with Rhaetia, which in Ptolemy is located across the Danube from Germania Superior. A logical conclusion to draw is that the Hermunduri extended over later Swabia and therefore the Alamanni originally derived from the Hermunduri. However, no Hermunduri appear in Ptolemy, though after the time of Ptolemy the Hermunduri joined with the Marcomanni in the wars of 166–180 against the empire. A careful reading of Tacitus provides one solution. He says that the source of the Elbe is among the Hermunduri, somewhat to the east of the upper Main . He places them also between the Naristi (Varisti), whose location at the very edge of the ancient Black Forest is well known, and the Marcomanni and Quadi. Moreover, the Hermunduri were broken in the Marcomannic Wars and made a separate peace with Rome. The Alamanni thus were probably not primarily the Hermunduri, although some elements of them may have been present in the mix of peoples at that time that became Alamannian. Before the mention of Alamanni in the time of Caracalla, one would search in vain for Alamanni in the moderately detailed geography of southern Germany in Claudius Ptolemy, written in Greek in the mid-second century; it is likely that at that time, the people who later used that name were known by other designations. Nevertheless some conclusions can be drawn from Ptolemy. Germania Superior is easily identified. Following up the Rhine one comes to a town, Mattiacum, which must be at the border of the Roman Germany (vicinity of Wiesbaden ). Upstream from it and between the Rhine and Abnoba (in the Black Forest ) are the Ingriones, Intuergi, Vangiones, Caritni and Vispi, some of whom were there since the days of the early empire or before. On the other side of the northern Black Forest were the Chatti about where Hesse is today, on the lower Main. Historic Swabia was eventually replaced by today's Baden-Württemberg , but it had been the most significant territory of mediaeval Alamannia, comprising all Germania Superior and territory east to Bavaria . It did not include the upper Main, but that is where Caracalla campaigned. Moreover, the territory of Germania Superior was not originally included among the Alemanni's possessions. However, if we look for the peoples in the region from the upper Main in the north, south to the Danube and east to the Czech Republic where the Quadi and Marcomanni were located, Ptolemy does not give any tribes. There are the Tubanti just south of the Chatti and at the other end of what was then the Black Forest, the Varisti, whose location is known. One possible reason for this distribution is that the population preferred not to live in the forest except in troubled times. The region between the forest and the Danube on the other hand included about a dozen settlements, or "cantons". Ptolemy's view of Germans in the region indicates that the tribal structure had lost its grip in the Black Forest region and was replaced by a canton structure. The tribes stayed in the Roman province, perhaps because the Romans offered stability. Also, Caracalla perhaps felt more comfortable about campaigning in the upper Main because he was not declaring war on any specific historic tribe, such as the Chatti or Cherusci, against whom Rome had suffered grievous losses. By Caracalla's time the name Alamanni was being used by cantons themselves banding together for purposes of supporting a citizen army (the "war bands"). The term Suebi has a double meaning in the sources. On the one hand Tacitus' Germania tells us ( Chapters 38, 39) that they occupy more than half of Germany, use a distinctive hair style, and are spiritually centered on the Semnones. On the other hand the Suebi of the upper Danube are described as though they were a tribe. Julius Caesar in Gallic Wars tells us ( 1.51) that Ariovistus had gathered an army from a wide region of Germany, but especially the Harudes, Marcomanni, Triboci, Vangiones, Nemetes and Sedusii. The Suebi were being invited to join. They lived in 100 cantons ( 4.1) from which 1000 young men per year were chosen for military service, a citizen-army by our standards and by comparison with the Roman professional army. The Alamanni established a series of territorially defined pagi (cantons) on the east bank of the Rhine. The exact number and extent of these pagi is unclear and probably changed over time. Pagi, usually pairs of pagi combined, formed kingdoms (regna) which, it is generally believed, were permanent and hereditary. Ammianus describes Alamanni rulers with various terms: reges excelsiores ante alios ("paramount kings"), reges proximi ("neighbouring kings"), reguli ("petty kings") and regales ("princes"). This may be a formal hierarchy, or they may be vague, overlapping terms, or a combination of both. In 357, there appear to have been two paramount kings (Chnodomar and Westralp) who probably acted as presidents of the confederation and seven other kings (reges). Their territories were small and mostly strung along the Rhine (although a few were in the hinterland). It is possible that the reguli were the rulers of the two pagi in each kingdom. Underneath the royal class were the nobles (called optimates by the Romans) and warriors (called armati by the Romans). The warriors consisted of professional warbands and levies of free men. Each nobleman could raise an average of ca. 50 warriors. The Alamanni were continually engaged in conflicts with the Roman Empire. They launched a major invasion of Gaul and northern Italy in 268, when the Romans were forced to denude much of their German frontier of troops in response to a massive invasion of the Goths from the east. Their raids throughout the three parts of Gaul were traumatic: Gregory of Tours (died ca 594) mentions their destructive force at the time of Valerian and Gallienus (253–260), when the Alemanni assembled under their "king", whom he calls Chrocus, who "by the advice, it is said, of his wicked mother, and overran the whole of the Gauls, and destroyed from their foundations all the temples which had been built in ancient times. And coming to Clermont he set on fire, overthrew and destroyed that shrine which they call Vasso Galatae in the Gallic tongue," martyring many Christians ( Historia Francorum Book I.32–34). Thus 6th century Gallo-Romans of Gregory's class, surrounded by the ruins of Roman temples and public buildings, attributed the destruction they saw to the plundering raids of the Alemanni. In the early summer of 268, the Emperor Gallienus halted their advance into Italy, but then had to deal with the Goths. When the Gothic campaign ended in Roman victory at the Battle of Naissus in September, Gallienus' successor Claudius II Gothicus turned north to deal with the Alamanni, who were swarming over all Italy north of the Po River . After efforts to secure a peaceful withdrawal failed, Claudius forced the Alamanni to battle at the Battle of Lake Benacus in November. The Alamanni were routed, forced back into Germany, and did not threaten Roman territory for many years afterwards. Their most famous battle against Rome took place in Argentoratum (Strasbourg ), in 357, where they were defeated by Julian, later Emperor of Rome, and their king Chnodomarius was taken prisoner to Rome. On January 2 366 the Alamanni yet again crossed the frozen Rhine in large numbers, to invade the Gallic provinces, this time being defeated by Valentinian (see Battle of Solicinium). In the great mixed invasion of 406, the Alamanni appear to have crossed the Rhine river a final time, conquering and then settling what is today Alsace and a large part of the Swiss Plateau. Fredegar's Chronicle gives the account. At Alba Augusta (Alba-la-Romaine ) the devastation was so complete, that the Christian bishop retired to Viviers, but in Gregory's account at Mende in Lozère, also deep in the heart of Gaul, bishop Privatus was forced to sacrifice to idols in the very cave where he was later venerated. It is thought this detail may be a generic literary ploy to epitomize the horrors of barbarian violence. 268, Battle of Lake Benacus—Romans under Emperor Claudius II defeat the Alamanni. Battle of Pavia—Aurelian destroys the retreating Alamanni army. 367, Battle of Solicinium—Romans under Emperor Valentinian I defeat yet another Alamanni incursion. 378, Battle of Argentovaria—Western Emperor Gratianus is victorious over the Alamanni, yet again. The kingdom of Alamannia between Strasbourg and Augsburg lasted until 496, when the Alamanni were conquered by Clovis I at the Battle of Tolbiac . The war of Clovis with the Alamanni forms the setting for the conversion of Clovis, briefly treated by Gregory of Tours ( Book II.31) Subsequently the Alamanni formed part of the Frankish dominions and were governed by a Frankish duke. In 746, Carloman ended an uprising by summarily executing all Alemannic nobility at the blood court at Cannstatt, and for the following century, Alamannia was ruled by Frankish dukes. Following the treaty of Verdun of 843, Alamannia became a province of the eastern kingdom of Louis the German, the precursor of the Holy Roman Empire. The duchy persisted until 1268. "they worship certain trees, the waters of rivers, hills and mountain valleys, in whose honour they sacrifice horses, cattle and countless other animals by beheading them, and imagine that they are performing an act of piety thereby." He also spoke of the particular ruthlessness of the Alamani in destroying Christian sanctuaries and plundering churches while the genuine Franks were respectful towards those sanctuaries. Agathias expresses his hope that the Alamanni would assume better manners through prolongued contact with the Franks, which is by all appearances what eventually happened. Apostles of the Alamanni were Saint Columbanus and his disciple Saint Gall. Jonas of Bobbio records that Columbanus was active in Bregenz , where he disrupted a beer sacrifice to Wodan. Despite these activities, for some time, the Alamanni seem to have continued their pagan cult activities, with only superficial or syncretistic Christian elements. In particular, there is no change in burial practice, and tumulus warrior graves continued to be erected throughout Merovingian times. Syncretism of traditional Germanic animal-style with Christian symbolism is also present in artwork, but Christian symbolism becomes more and more prevalent during the 7th century. Unlike the later Christianization of the Saxon and of the Slavs, the Alamanni seem to have adopted Christianity gradually, and voluntarily, spread in emulation of the Merovingian elite. From ca. the 520s to the 620s, there was a surge of Alamannic Elder Futhark inscriptions. About 80 specimens have survived, roughly half of them on fibulae, others on belt buckles (see Pforzen buckle, Bülach fibula) and other jewelry and weapon parts. Use of runes subsides with the advance of Christianity. The establishment of the bishopric of Konstanz cannot be dated exactly and was possibly undertaken by Columbanus himself (before 612). In any case, it existed by 635, when Gunzo appointed John of Grab bishop. Constance was a missionary bishopric in newly converted lands, and did not look back on late Roman church history (unlike the Raetian bishopric of Chur , established 451) and Basel , which was an episcopal seat from 740, and which continued the line of Bishops of Augusta Raurica , see Bishop of Basel. The establishment of the church as an institution recognized by worldly rulers is also visible in legal history. In the early 7th century Pactus Alamannorum hardly ever mentions the special privileges of the church, while Lantfrid's Lex Alamannorum of 720 has an entire chapter reserved for ecclesial matters alone. Johann Jacob Hofmann, Lexicon Universale, Leiden 1698, "Alamannicus". "He was, nevertheless, of some benefit to the Gauls, for he crushed the Alamanni—who then were still called Germans—and not without illustrious glory, though he never fought save in brigand-fashion". Histoire de l'Académie Royale des Inscriptions et Belles-Lettres, avec les Mémoires de Littérature tirés des Registres de cette Académie, depuis l'année MDCCXLIV jusques et compris l'année MDCCXLVI, vol. XVIII, (Paris 1753) pp.49–71. Excerpts are on-line at ELIOHS. It is cited in most etymological dictionaries, such as the American Heritage Dictionary (large edition) under the root, *man-. Ptolemy's description has some limitations. Upper Germany and Lower Germany are mentioned by name, but only as specific districts of Gallia Belgica (2.8), the border between them was an unidentified river, the Obruncus. The region is repeated again under Germany, but this time he does not list Roman boundaries. Germania Superior, the Agri Decumates and the limes are not to be found there, even though they certainly existed at the time. "Germania Magna" is found within the Rhine, Danube, Vistula and shores of the "Oceanus Germanicus". Most of the tribes are missing or listed without name. The Main is not there, nor Lake Constance. The Danube runs from the Alps. The Rhine does not bend to the south next to Swabia. Ptolemy's Germania is like a surreal image of itself, accurate only if you follow certain known lines, but the overall shape is greatly distorted. R. Keydell, Agathiae Myrinaei historiarum libri quinque Corpus Fontium Historiae Byzantinae. Series Berolinensis 2. Berlin: De Gruyter, 1967, p. 18f.